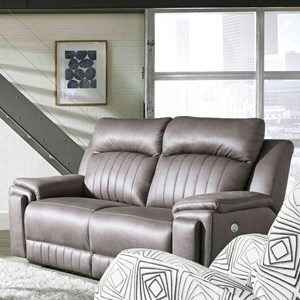 Style and relaxation go hand-in-hand with this contemporary reclining sofa. Its thin profile pillow arms and handsome vertical stitching gives it a modern styling that will fit right in with your home. 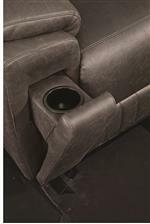 Step up your comfort and make your life a little easier with features like Reclina-Pedic memory foam and hidden cup holders. 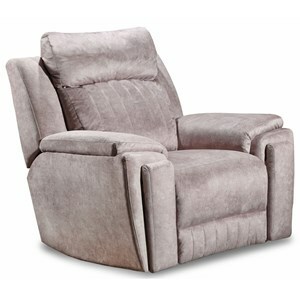 The Silver Screen Contemporary Double Reclining Powerplus Sofa with Hidden Arm Cup Holders by Southern Motion at Hudson's Furniture in the Tampa, St Petersburg, Orlando, Ormond Beach & Sarasota Florida area. Product availability may vary. Contact us for the most current availability on this product. The Silver Screen collection is a great option if you are looking for Contemporary furniture in the Tampa, St Petersburg, Orlando, Ormond Beach & Sarasota Florida area. Browse other items in the Silver Screen collection from Hudson's Furniture in the Tampa, St Petersburg, Orlando, Ormond Beach & Sarasota Florida area.